WTF Are You Reading? 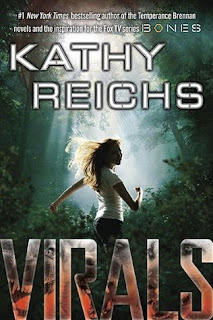 : You Won't Get Sick of "Virals"
You Won't Get Sick of "Virals"
Length: 9 hours 41 mins. As the friends discover their heightened senses and animal-quick reflexes, they must combine their scientific curiosity with their newfound physical gifts to solve a cold-case murder that has suddenly become very hot if they can stay alive long enough to catch the killer's scent. Victoria "Tory" Brennan may be the daughter of a marine biologist and the niece of Temperance Brennan; but the mystery and intrigue in which she finds herself and the way that she deals with it are all her own. As with a great many YA novels, this books major downfall was the lack of parental involvement. I mean this girl and her friends manage to stumble upon and become irrevocably altered by an illegal experiment, uncover the corpse of a long dead girl by first unearthing and researching the ownership of found dog tags, and let's not forget to mention the "killer" powers that she and the guys deal with while the parents are off in "la la land". I know that parents are busy, but there are several times within this read that these kids could end up in jail or dead and the parents have not the foggiest. I am not saying that the parents should have their kids tied to their legs at every moment, but some of the situations that were in this book were let's just say NC-17 at least. This is a great read for the teen mystery/thriller buff who loves the strong female lead, super powers, and the happy ending. I really enjoyed Virals and loved following the adventures in Seizure.